There will come a time where you will forget your password, and when that time comes, this page will be right here waiting for you. The instructions are similar to Change Passwords, but you will need to have your date of birth and challenge questions set up before you can use this function. 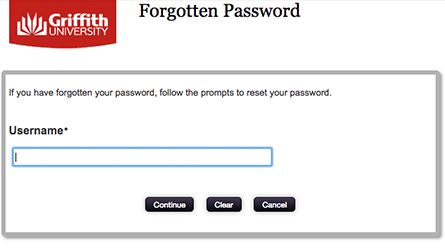 Assisted password resets are only available via phone and in person at student admin or the library services desk. 1. 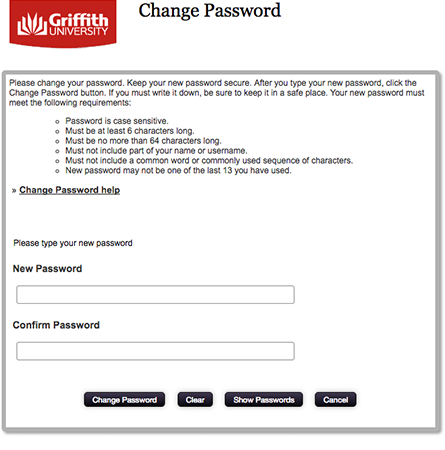 Select Forgot password on the Single Sign On page, or go directly to Reset Password. Enter your (sNumber) and select Continue. 2. Type your date of birth (ddmmyyyy) and answer your challenge questions. If successful, the Code of Conduct will display, select I agree and Continue. Learn how to set up challenge questions. Staff: this password change will affect your web browser access to staff email, but not the password you use for your email desktop application (IMAP\POP) or mobile device. Students: Please update your student email desktop application (IMAP\POP) or mobile device. 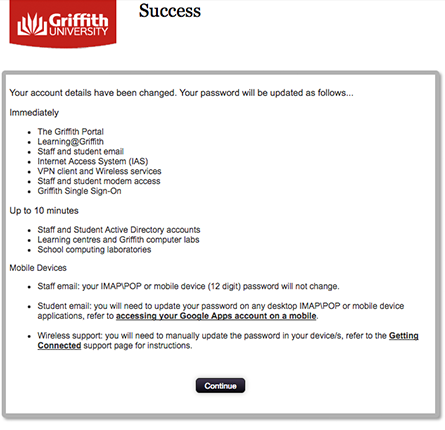 Go to Griffith University - Google Apps Support for more information. Otherwise, you may login via webmail.